THE KLINGON EMPIRE WANTS YOU… to toughen up. 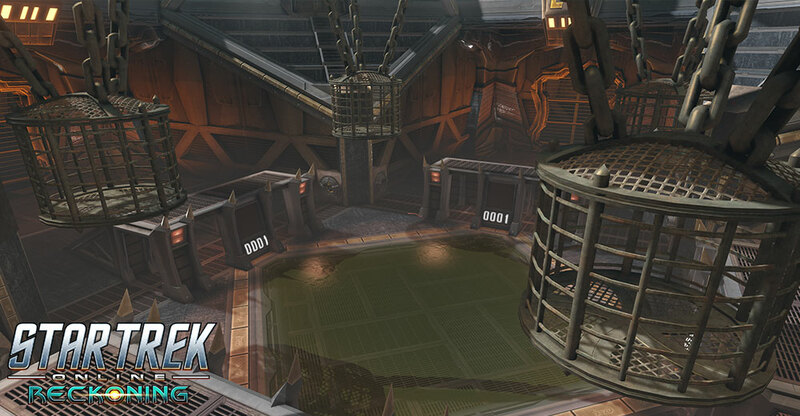 From Thursday, May 4th at 9:00 AM PST, until Monday, May 8th at 10:00 AM PST, Federation, Klingon, and Romulan Republic Captains on Xbox One and Playstation 4 between levels 50-60 can queue up for our new “Arena of Sompek” event. Enter a Klingon holodeck to train in one of the Empire’s oldest traditions, the qaD HoS - an endless battle against allies and enemies alike! Once the battle starts, it doesn’t end until all captains fall. Between environmental hazards and ever-strengthening enemies, captains will need to keep moving and fight as a team to last as long as they can. The longer you last, the more rewards you will earn, including your choice of Marks. Can you survive longer than your fleetmates? Can you prove yourself to be a Hero of the Alliance? Can you earn lots of rewards? Gather your friends, queue up for the “Arena of Sompek,” and we’ll find out! Here are the rewards Captains can expect, depending on the rounds they complete. Captains will earn two new titles for every seven rounds of the Arena they complete, and two final titles for reaching the 100th round. Passing round four in the arena will grant Captains a voucher once per day that can be applied toward a special reward: The Sompek Lightning Universal Kit Module. This powerful module calls down the Arena lightning strike for captains in the field! Enter the Arena Captains, great rewards await you.